Today’s posts are all tumblr reblogs of Lauren Bacall in 1944, the year of her film debut in To Have and Have Not. Also, a link to a recent SNL skit with Kate McKinnon and John Mulaney as Bogart and Bacall. Lauren Bacall (1944), the year of her film debut in To Have and Have Not. Lauren Bacall in 1945, in between her two movies with Howard Hawks and Humphrey Bogart. Lauren Bacall and Ann Dvorak were the two Howard Hawks discoveries with whom he made two films apiece. He made To Have and Have Not and The Big Sleep with Lauren, and Scarface and The Crowd Roars with Ann. 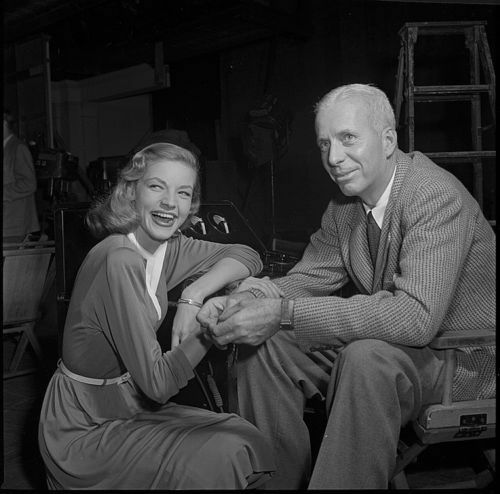 Howard Hawks with his discovery Lauren Bacall being coached for her film debut in To Have and Have Not (1944).